Many people tend to get a little absentminded or forget a few things as they age. 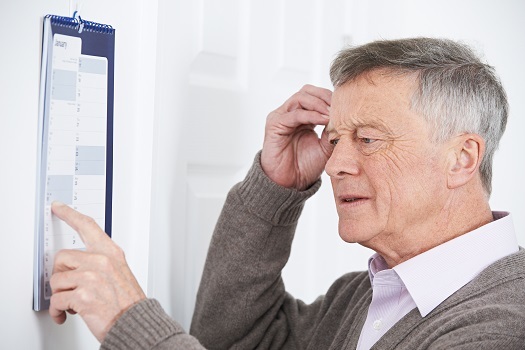 However, in some cases, forgetfulness can be a symptom of dementia. Though it may be difficult to notice dementia at first, a prompt diagnosis is important if you want to get treatment for your senior loved one. Here are six signs your loved one may be developing some form of dementia. Dementia makes it difficult for seniors to process information for multistep tasks. Do you notice your loved one having difficulty following a recipe, balancing a checkbook, or completing a woodworking project? Difficulties like these could indicate the onset of dementia and make your loved one’s daily life challenging. If your elderly loved one needs help maintaining a high quality of life while aging in place, reach out to Home Care Assistance, a trusted provider of Winnipeg home care. Our caregivers provide transportation to and from medical appointments and social events, nutritious meal preparation, assistance with daily exercise, and help with everyday tasks like bathing, grooming, and light housekeeping. Some seniors with dementia may seem to suddenly lose self-control. They might spend a lot of money, jump into a relationship with a stranger, or take up a risky habit. If your loved one starts making rash decisions, it’s a good idea to get him or her checked for dementia. Many seniors have occasional memory loss, but keep an eye out for repeated and worrying incidents. Seniors with dementia tend to frequently misplace things, lose track of time, miss appointments, or forget important tasks. They tend to remember past events and forget the recent ones. Caring for older adults with dementia can be a challenging task. Families who find it difficult to care for their aging loved ones without assistance can benefit greatly from professional respite care. Winnipeg, MB, family caregivers who need a break from their caregiving duties can turn to Home Care Assistance. Using our proprietary Balanced Care Method, our respite caregivers can encourage your loved one to eat well, exercise regularly, get plenty of mental and social stimulation, and focus on other lifestyle factors that promote longevity. Seniors with dementia tend to get confused about things like their location, the person they’re interacting with, the time of day, or the storyline in a movie they are watching. In the early stages of dementia, seniors quickly recover from this confusion and begin to understand what is happening around them again. However, the confusion may become more persistent as the disease progresses. When you spend time with your loved one, notice how he or she converses with you and others. Dementia frequently causes seniors to use the wrong word for an object, talk with pauses, and use shorter sentences. You should also try to think about how your loved one’s talking habits match past behaviors. Previously chatty seniors may start talking less as they try to compensate for their impaired language. Was your loved one formerly shy but is now the life of the party? Has a previously sweet and kind senior started snapping at everyone? These sorts of sudden changes may be a sign of dementia. As the disease alters the brain, some seniors may start presenting drastically different personalities, lose interest in former hobbies, or become depressed and apathetic. Dementia is just one of the many health issues older adults are susceptible to. Seniors can face a variety of challenges as they age, many of which can be mitigated with the help of professional in-home caregivers who provide high-quality senior care. Winnipeg families trust in Home Care Assistance to help their elderly loved ones age in place safely and comfortably. To learn about our high-quality in-home care options, give us a call at (204) 489 6000 today.